DeSilva+Phillips client, TV Guide Magazine and its digital platform, TV Insider, have been sold by OpenGate Capital to NTVB Media, a leading publisher of TV entertainment and listings magazines, creating the nation’s largest group of consumer television publications. The acquisition creates the country’s largest group of print publications for television watchers, with TV Guide Magazine’s 1.8 million subscribers and NTVB’s 1 million. Both groups also have a growing digital presence. TV Guide Magazine is the No. 1 television magazine, the No. 2 entertainment magazine, and the 15th largest magazine in the U.S. Its iconic logo is recognized around the world. TV Insider is the fastest growing website in the entertainment category, powered by organic growth. NTVB’s flagship TV Weekly magazine is a region-specific television guide that is marketed in partnership with more than 160 leading U.S. newspapers. NTVB also publishes Channel Guide Magazine, Hopper Magazine and VIEW! magazine in partnership with some of the largest cable and satellite companies in the nation. The powerful combination of NTVB and TVGM will offer the largest, most efficient way to reach active television viewers. Together they will reach more than 20 million consumers when they are making their viewing decisions. TVGM CEO David J. Fishman and CFO Joe Clemente will remain with the company. “OpenGate and the great team at TVGM led by David and Joe have successfully right-sized TV Guide Magazine, driving profitability and positioning the company for success in the digital age,” DeAngelis said. By joining forces, the two companies encompass powerful digital capabilities that will help them speed development and content creation, and enhance digital marketing. In addition, both companies have strong editorial and creative staffs dedicated to developing new and unique offerings. 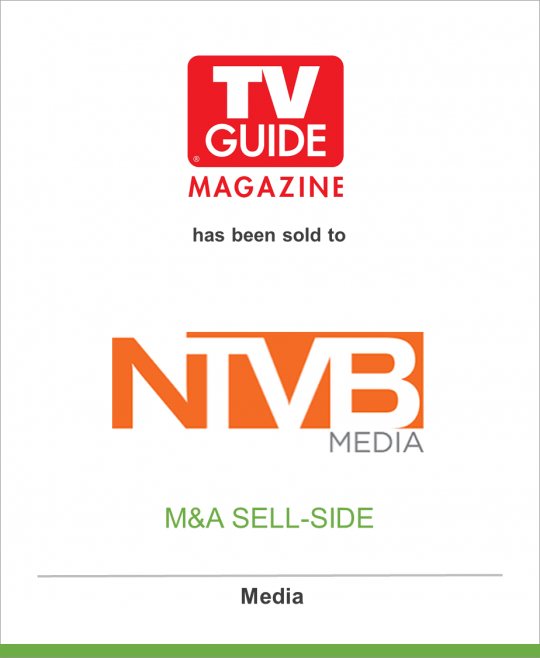 TV Guide Magazine and TVInsider.com will maintain offices in New York, Los Angeles and Newtown Square, Pa.
About NTVB Media, Inc: In its 30-year history, NTVB has helped media companies maintain and grow subscriptions, increase revenue and improve customer service. NTVB has partnered with the top U.S. cable and satellite companies and more than 160 leading newspapers across the U.S. Its clients include Comcast, DISH Network, Time Warner Cable, Suddenlink, Wide Open West, the Los Angeles Times, Chicago Sun-Times Group, Denver Post, Long Island Newsday, Los Angeles Newspaper Group, San Francisco Chronicle, Philadelphia Inquirer, Boston Globe, Detroit Free Press, Dallas Morning News, Houston Chronicle, Charlotte Observer, Minneapolis Star Tribune, San Diego Union Tribune, Seattle Times, Portland Oregonian, and others. NTVB Media is based in Troy, Mich., with offices in New York, Los Angeles and Glendale, Wisc. About TV Guide Magazine: TV Guide Magazine LLC is owned by NTVB Media, Inc. TV Guide Magazine is one of the most popular magazines in the country with over 12 million weekly readers. Celebrating more than 60 years as America’s most trusted television authority, TV Guide Magazine is the premier source for entertainment news, guidance, and information about the country’s most popular leisure time activity. For more information, please visit TVGuideMagazine.com.